With Bee, you can fall sleep anywhere and in any kind of environment ! Whenever it's bed time, you would simply close your eyes and sleep. Just like that. Sometime when we're out, like we would be at a restaurant, you would say to me "I'm sleepy", then fall asleep after saying that ! it's like magic. I love it. When more teeth came in, I even brushed your teeth while you're half asleep ! your eyes are closed but you open your mouth to let me floss and run the brush around your mouth. You even rinse with your eyes closed ! it's pretty awesome. As for Lovebug, right now you fall asleep mostly while nursing. If you ever wake up, a constant repeated firm pat on your bum will lull you back to sleep. Sometime your eyes are open but it's not really "open". You sleep like that, like your sister and like me ! We like we freak people out sleeping with our eyes open. You did fall asleep one time while sitting in the Costco's shopping cart ! You just look at me and close your eyes. I freaked out, thought something happened to you, but nope, you were tired and decided to go to sleep then and there. No tear, no fuss, no need to be held. Please keep that up ! Thank you for loving to sleep as much as I and your daddy. I do enjoy sleeping next to you a lot ! 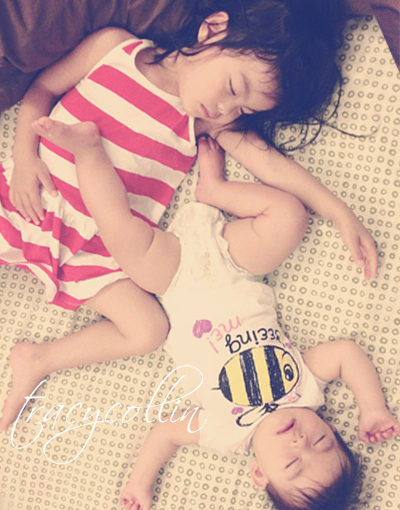 I love holding you both close, watching you two sleep and kissing your foreheads. Please don't grow up too fast.